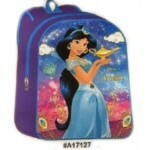 Send your kids to school with her favorite Disney character on her school backpack. There is pl.. Send your little stormtrooper to school in style with their favorite movie on their new wh.. Send your little ghoul to school with their favorite tv character printed on their wholesa..